Who Is Tom St. Louis? For many years Trial Lawyers were the biggest buyers of Yellow Pages space. They would shell out $100,000 and sometimes a lot more in annual expense to enter the cut throat competition for new clients. I spent years obsessing with ‘The Magic Moment’ when an at need prospect decided to pull the trigger in favor of one or another supplier. In particular I worked with law firms to create the Million Dollar ad. When we succeeded it was a beautiful thing, because we were eating everyone else’s lunch, and they usually didn’t know. Enter Google, the biggest game changer the advertising world has ever seen. They define relevance on the Internet. They are fanatically obsessed with sending people to where they want to go. And, they have recently changed their search criteria to favor local traffic. Only a fraction of law firms are aware of this. And, among those, very few are taking effective advantage of the situation. Smell an opportunity here? Right now, law firms have a great opportunity to gather up some low hanging fruit. 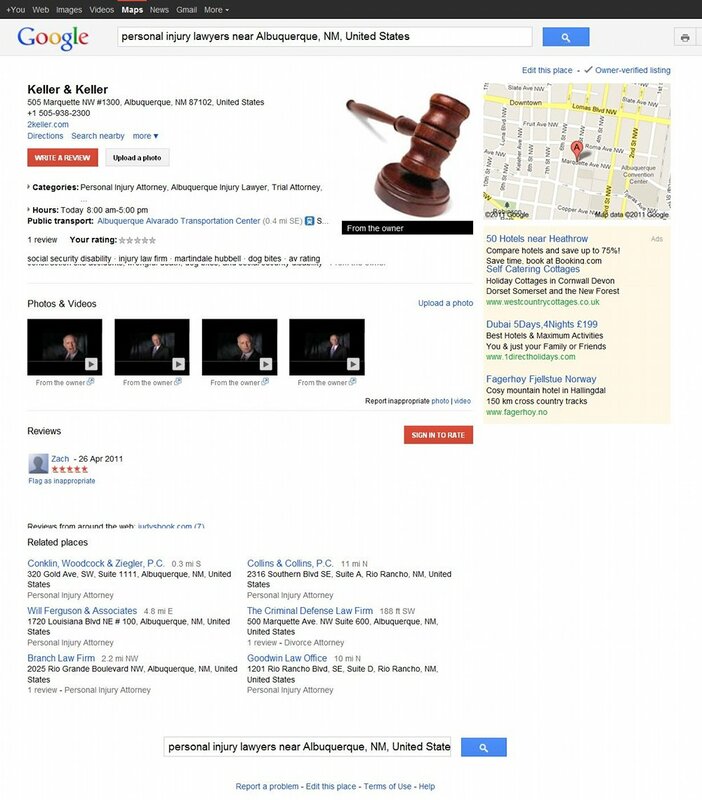 Google has provided every registered business, including law firms, with a free mini local website. And, they will send you traffic if you will bother to fill it out, tell the right people, get reviews and pay attention to it month over month. There is no way in hell you can ever spend $100,000 on it. Google does not charge you for it. And they are trying to send you clients if you’ll only let them. So, first check out this image. 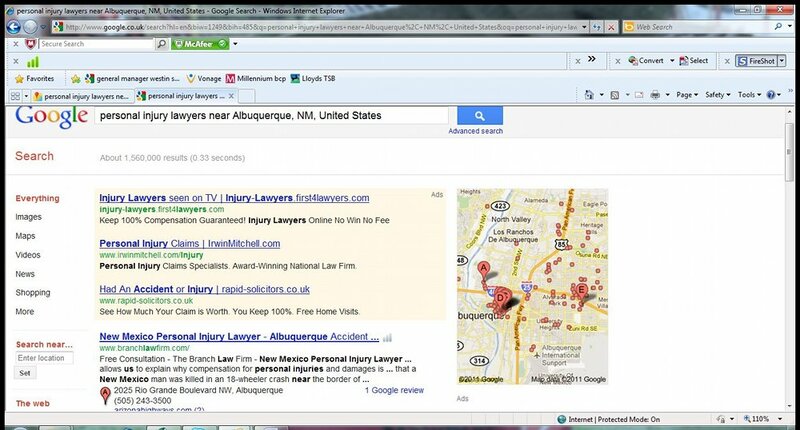 This is a Google search for personal injury lawyers in Albuquerque, New Mexico. See all those red pins? 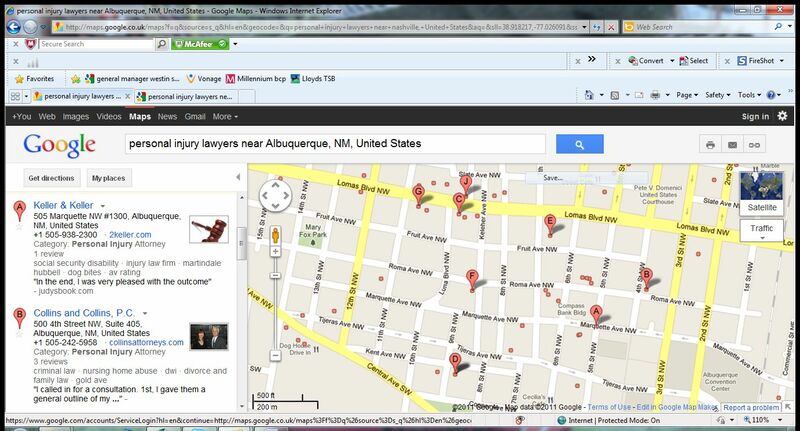 Each red pin is a law firm that has not even bothered to fill in their Google Places page. It sits there, unclaimed. See all the letters? From ‘A’ to ‘J’? Those are the players ranked in order of relevance. This next image is what ‘A’ looks like. In other words it’s the top traffic getter from Google Places. You will notice that there are images and videos and information. There’s a lot more that can be done. But so few law firms are doing anything…that this is truly a situation where the one eyed man is king. Now take a look at what an unclaimed Google Places page looks like. This is not rocket science. A staff member can get this going in a few minutes. But because it’s free and easy, you might fall into the trap of putting no effort into it. Or, doing the bare minimum, and then forgetting all about it. What does it take to dominate Google Places? Google won’t let that happen. And every time Google catches someone trying to game the system, they kick them to the curb without hesitation and without apology. But get this—especially if you are investing in SEO to build up your organic search traffic. The top pins are getting a lot of high quality traffic which readily converts to clients in exactly the same way it used to work in the Yellow Pages. Catch the Latest in Marketing! Marketing From the Heart · Growing your smallish business while being a decent and not too stressed out human at the same time.